If the West Coast Trail is still on your list or you know someone who's been asking about it, we have had some spaces open up! Let me start by making sure that our collective appreciation of your trip and your guides to the Johnston Strait this last week gets official. Simply put, for my part just about every expectation was not only met but well exceeded. Thanks for that! Hi Len, I just wanted to let you know how fantastic I think your team is. Your guides made this West Coast Trail trip truly the trip of a lifetime for us. I’ve been to 24 countries and have had lots of amazing experiences, but this one trumps them all. Although, we decided not to tell folks how fantastic the food was, we didn’t want anyone to think it was a “walk in the park”….thanks for everything!!! We’ll definitely be back!!!! Nahanni trip was just great and Janell and I were so pleased. Your guide Adam worked extra hard but still did a wonderful job. Can’t say enough good things about your company! A few days ago I finished a wonderful trip through the Bowron Lakes Chain. Your superb guides, Georgia and Vick, with their bright attitudes and professional competence, made a great trip fantastic. Did I mention the food? It was outstanding! While I have only used one other outdoor company, REI, to Peru last year, I check around from time to time and can say with confidence STS is an excellent bargain. The spirit in which the adventures are handled are a cut above. Fill out your Email address to receive our newsletter! 30 years of leading expeditions. Food Drops are arranged whenever possible. Our guides carry most of group equipment during hike thus reducing the weight you need to carry. Certified guides with Wilderness First Aid. Diversified, tasty menu with meals prepared by our guides. Top of the line equipment including tents. Trip origins set to save costs and simplify travel logistics. Comprehensive package of conditioning and equipment/clothing information. On going preparation support from our office. 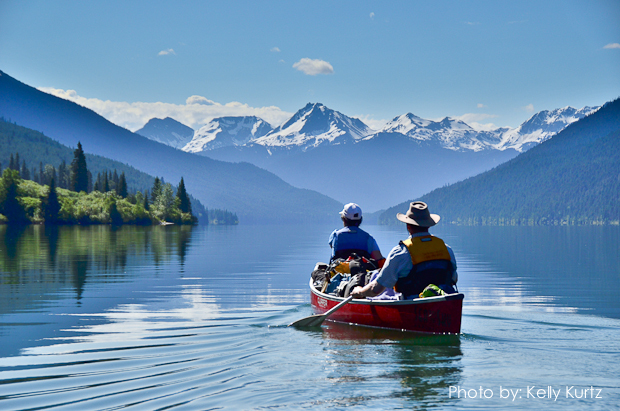 Sea to Sky Expeditions has been showcasing BC's incredible outdoors since 1988. Our goal is to provide a safe wilderness experience which meets your expectations and stirs within you the same love, caring, and passion for nature and the great outdoors that our guides possess.